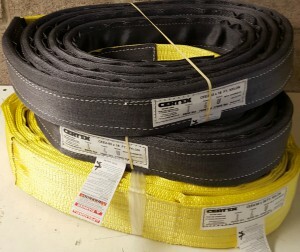 CERTEX, USA has been setting the standard for manufacturing synthetic web slings for over 30 years. We manufacture our web slings with the highest quality nylon or polyester so that these slings offer outstanding strength with excellent load protection. CERTEX web slings will not damage or scratch the surfaces of your products being lifted. These web slings are lightweight, durable, and flexible so that they can be easily handled and rigged to a load. Our web slings easily adjust and conform to the load with a non slip, secure grip and are treated to keep out dirt, moisture and reduce abrasion. Nylon and polyester web slings are unaffected by oil and grease and offer good chemical resistance. Treated and untreated nylon and polyester webbing, our web slings are used to fabricate synthetic slings, per class 5 and class 7 rated capacity charts, may contain red yarn woven into the core of the webbing to serve only as one of many aids in determining whether and when a sling should be removed from service.